If you have ever thought about converting to a COP system, or have already converted and are not happy with the fitment of the coils you have selected, this might be of interest to you. 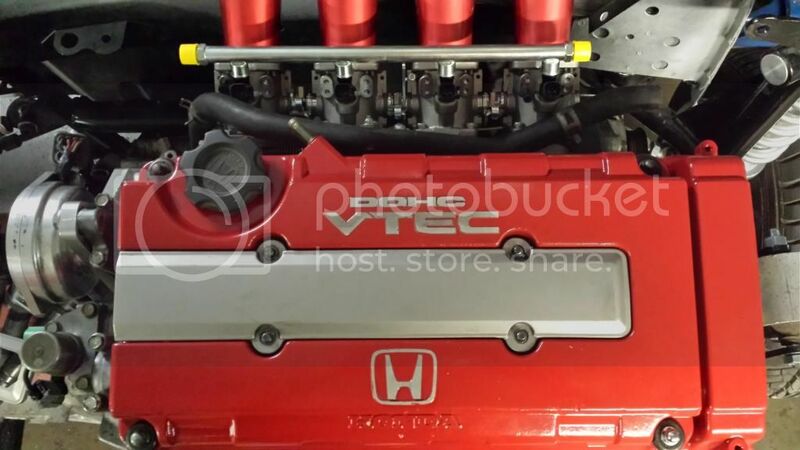 I have recently discovered that it is possible to modify an Audi/VW coil to fit perfectly on a Honda B-Series VTEC head. 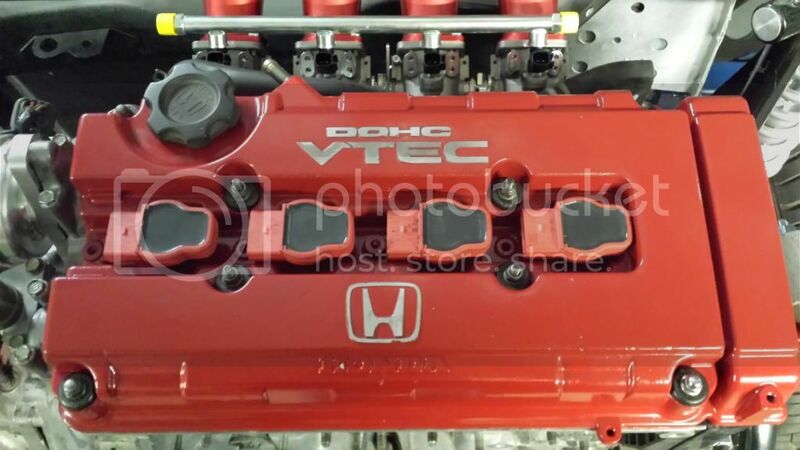 Once the modification has been performed, the coils fit correctly on the plugs and seal completely in the valve cover. 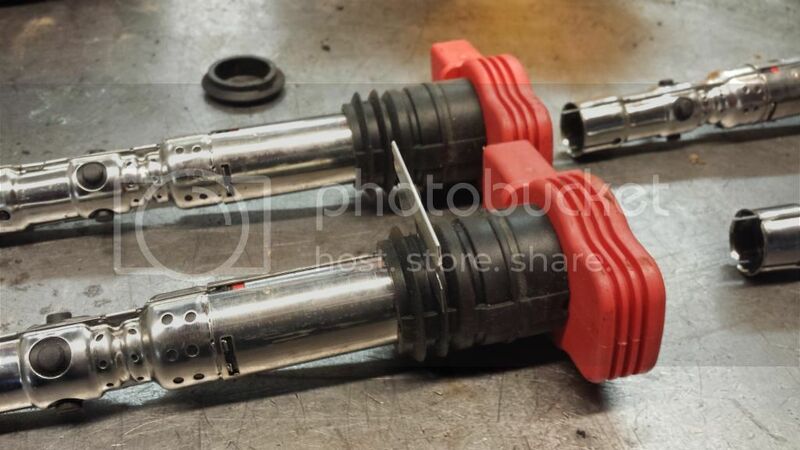 They are designed to hold onto the spark plug heads, so it is not necessary to bolt them down or use a cap to hold them in place, which is very convenient. The coils I used were pulled from a 2002 Audi 3.0l V6. 1.) Using a razor blade, or similar cutting device, remove the lower seal from the coil assembly. 2.) Push the coil assembly onto spark plug. 3.) Wire the coil(s) to your engine management system accordingly. Have you wired them up yet, and run it ? Did you cut the wiring plugs required from the Audi loom ? I like that! Been wanting to change for ages! Anyone know if neptune rtp can have COP? Send a private message to MiniMadGreg. Find More Posts by MiniMadGreg. If you could give us a start-to-finish account of this, it'd make a great sticky. Nice mod. As a volkswagen nut I really like this. Looking forward to more info. 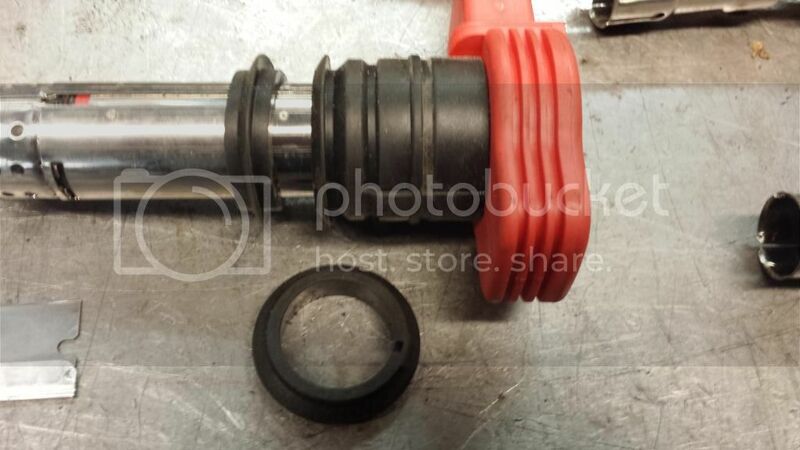 The outer diameter of the sealing area is 32.75 mm when uncompressed. The minimum compressed diameter that can be had is 31.00 mm. I have attached a photo with a measure, as the exact length you may need could vary a touch. When wiring the coils, I would personally suggest grounding the #4 pins directly to the head and routing the #2 pins to the same grounding location that your ECU is grounded to. Pins #3 will be wired to the coil outputs of your ECU, and can be configured for wasted spark if your ECU only has one output per pair of cylinders. Last edited by B20C5; 21-12-2014 at 09:18 PM. Cheers. Do you still need the dizzy or does the ecu use a different signal for rpm trigger? Last edited by Underhauled; 21-12-2014 at 10:50 PM. Yes and no... The ECU still needs a CKP and CYP signal. This can be taken from the stock distributor base, an aftermarket distributor base, or from an aftermarket sensor like this AEM one. I am using an MSD base without a cap as the AEM one did not exist when I converted to COP. Last edited by B20C5; 22-12-2014 at 02:43 AM. I will update this with some more pictures and tips as I move forward. Everything up to this point is correct and will work the way it has been described. I have already done it with S2000 coils and I just like the fit of the Audi coils better. After looking more closely at the Hondata CPR, it is evident that Hondata is using the stock ICM pin to signal the CPR unit to fire at the indicated time and has re-designated the ALT-C pin to communicate to the CPR which coil to fire. 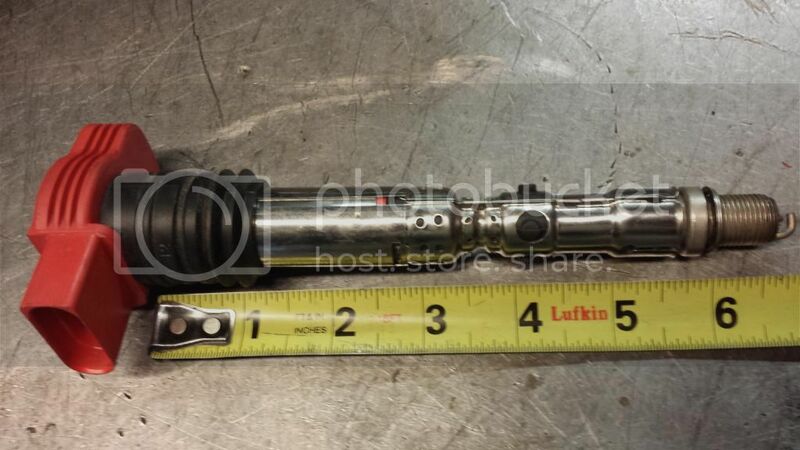 My guess is that Hondata has chosen to use a wasted spark and are grounding the ALT-C pin during the ignition cycle for two of the four cylinders. Having said that, if the Neptune software will allow you to re-purpose the ALT-C pin as an ignition timed output and you can ground it alternately with the ICM output, you might be able to make the Hondata CPR work with your Neptune RTP. Last edited by B20C5; 22-12-2014 at 04:15 AM. 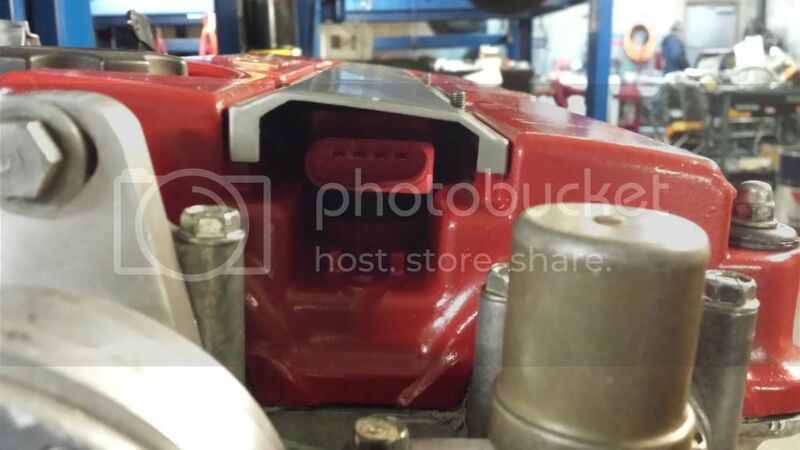 Looks cool when you lift the spark plug cover, but is there any performance benefit? If so, what?? You get rid of the troublesome dizzy and move into the 21st century lol. Also more room in the engine bay. Adjustable dwell time for individual cylinders, higher voltage spark (especially useful on higher revving engines) as the coils have more time to energise than a single coil. That's handy - was just going to ask / google the reason. Sorry for resurrecting an old thread but does anybody have any photos (the ones above have disappeared) of the specific COP used. I've got VW COPs but not sure if they are the right ones for my B18 - the plug tops (screw on caps) appear to be too small for the COP - I could try a different plug top I suppose?